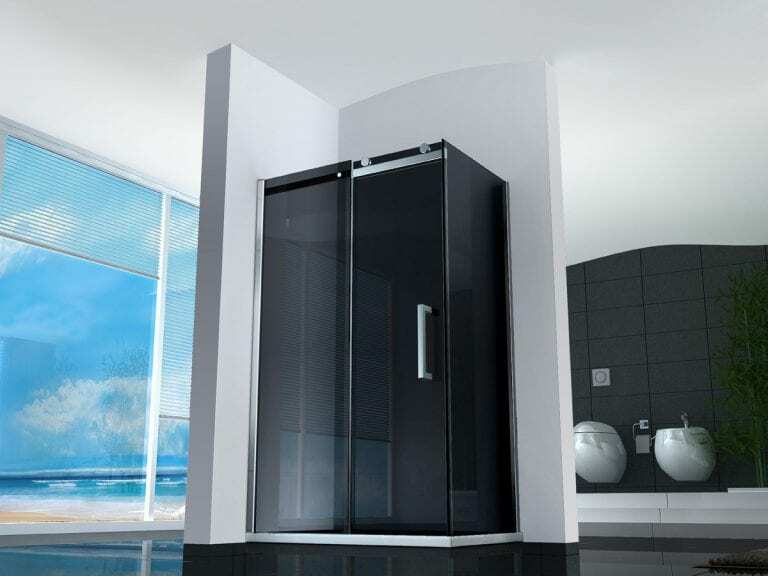 Say goodbye to plastic curtains and say hello to beautiful stand alone showers with gorgeous glass doors. From chic and clean to ones with a bit of an artistic edge, there are a plethora of routes to take when it comes to created or renovating your new bathroom. We’ve compiled a list that gives you a taste of a variety of ideas and how each of them has the ability to transform the space into something quite special. 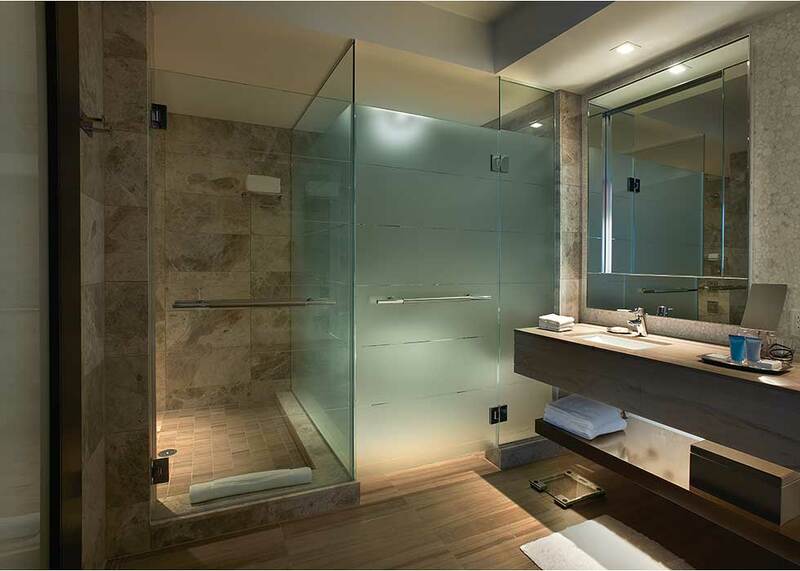 Let’s have a peek at 15 decorative glass shower doors designs and get inspired about updating the bathroom! This puzzle look has a beautiful finish that reacts to the incredible chic and modern atmosphere of the ambience. The door has a “shattered” accent that creates a magical focal point in a very clean and clever way. It gives an artistic appeal and luxurious, edgy essence that we’re swooning over. Here’s a great example of a traditional and simple rounded idea. You can see right inside the space with ease and there’s a handle attached making it easier to use than push models. Overall, the neutral colors work well and can be paired with furnishings and other colors easily. Who knew that glass could be so alive and refreshing? These decals sure do liven up the bathing experience, don’t you think? Just take a look at what’s going on here. This interior idea has its own outdoor scene that turns a very plain space of the house into something more special and personalized. This idea is a bit unique since you can’t see through the panels. It could be by design in that the owner wants more privacy due to perhaps this space being shared. It’s got a textural, seashell and Asian inspired theme with a bit of femininity made right inside. It surely brightens up the gray-covered room with a bright corner pop and it creates an easy focal point for a guest or master suite! The jagged edges and interesting textures make this design one of our favorites. It gives this lavatory a holiday, home-away-from-home type feel without you actually having to go on vacation to feel that way. 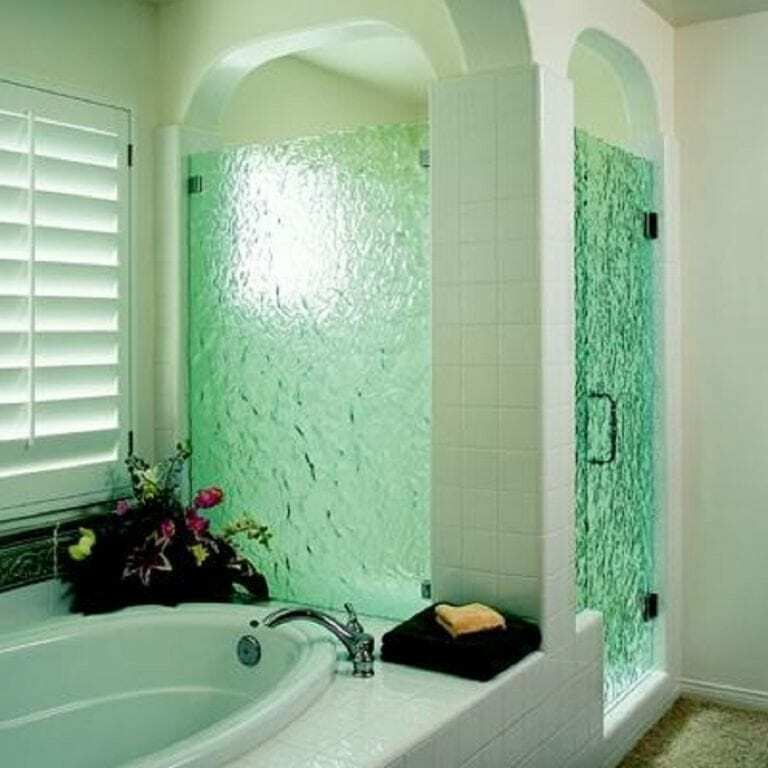 It may be dark inside but this bathroom definitely refreshes. This cabin has a more traditional feel than most of its predecessors, except that some pieces are frosted for privacy. You may share this space, but that doesn’t mean you want your partner looking in. With this look you’ll get that modern feel without all the eyes on you! Even your smaller stand alone enclosures can be spruced up using glass as opposed to curtains. 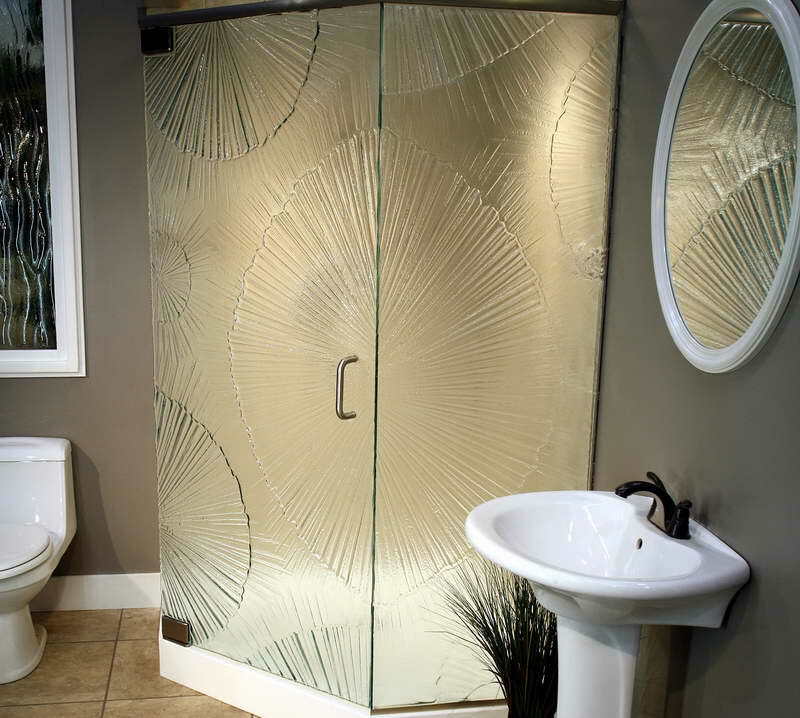 This frosted, textured idea gives privacy and interest to smaller lavatories. And the addition of the ice cube blocks give even more fun and liveliness! The swirling accent detailed onto this idea is reminiscent of rolling waves in the ocean. What a great way to jazz up bathing with the relaxing set of a beachside scene! We love this extra addition as opposed to a more traditional and simpler experience. Similar to the example shown above, this piece too has a ocean scene on display. This is such a fun and personal way to jazz up your space. The motif is surprising, acts as a focal piece and it surely give off a great impression to any guests that come inside. Again, we love this idea in plainer bathroom that need a big of extra design touch. 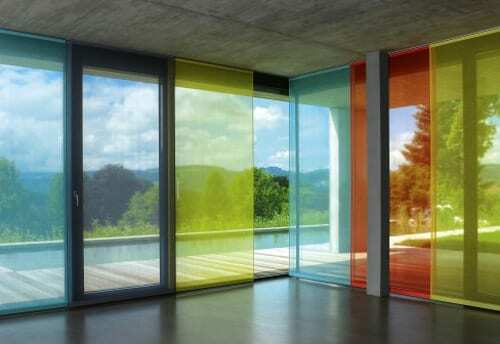 Glass can be tinted too! Not only are do these pieces have a fun texture that gives an artistic essence and privacy inside, the mint green shadows blend in with the brightness and refreshing nature of the room. Imagine the same look with a powder blue or even blush pink tint, magical and memorable! There are an array of different feelings that come with frosting and this one has a very chic and posh feel. The entire idea has a bright and light feel with clean lines and sharp, contemporary vibes. And the sleek glass door only adds and enhances that overall style. With a dark foundation such as this, there was no other option to go with than with a simple attachment. Any other choice would get lost in the mix within the chocolate brown outer shell of this stand alone enclosure. We love it though and admire its masculine energy and very clean appeal. A personal favorite from the entire list, the design is simple, sweet and with an infusion of French charm. The daintiness of this design is perfect for the small space and Parisian styles that are sprinkled around this charming setting. The etching goes great with the claw foot tub and wonderful hardware. This graphic design spread sure puts some great ideas and inspiration inside our heads for our next renovation or dream house sketch. The black tinted glass helps to even out the modern, futuristic feel that this entire space has and with the natural lighting coming in through the windows it doesn’t darken too much. 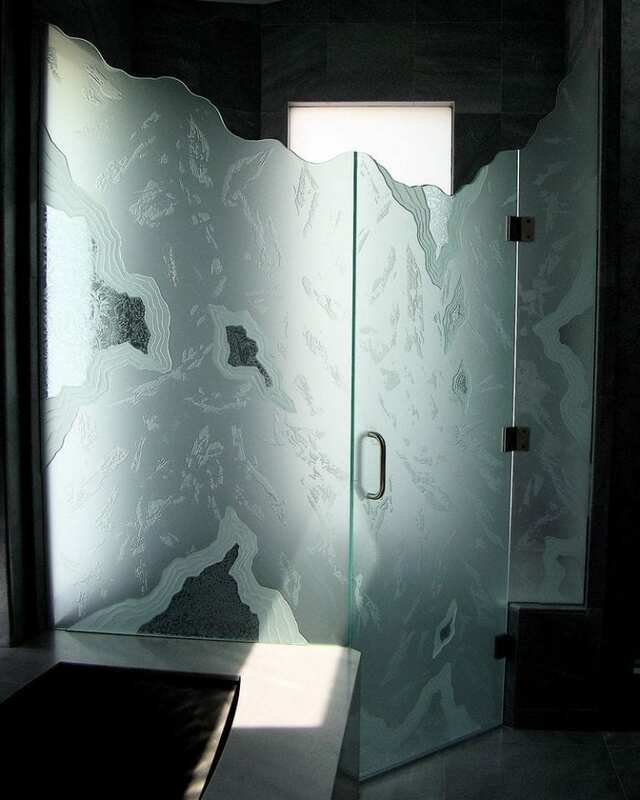 Here’s another decorative example of a traditional setting with both classic glass and frosted placements. 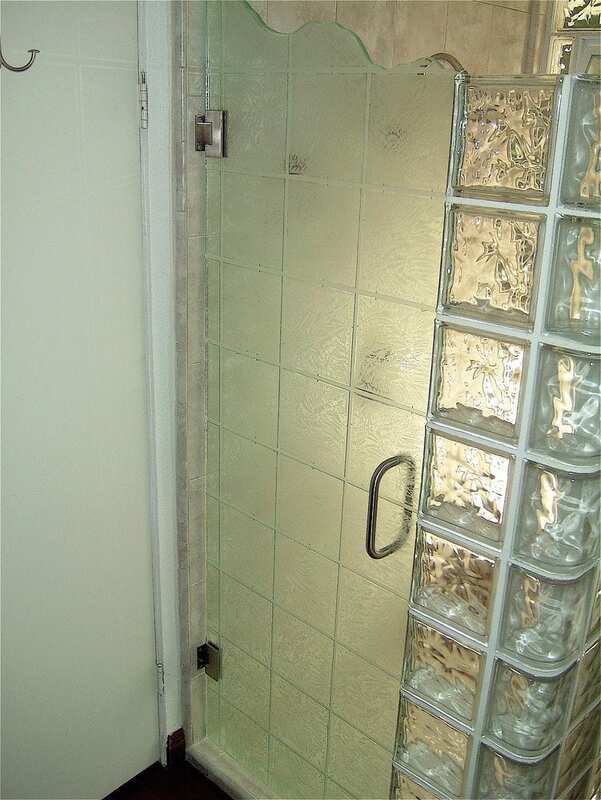 This gives you the privacy you deserve with the appeal of a more interesting way of decorating a bathroom. There is still a sleek, clean vibe without being over-the-top or overwhelming in such a functional setting.